The Board of Directors of the West Virginia Cave Conservancy approved this Management Plan on March 15, 2009. The West Virginia Cave Conservancy (WVCC), a non-profit, West Virginia Corporation, has purchased approximately 5 acres from DNB, LLC that includes the lands around the Scott Entrance to Maxwelton Sink Cave. This parcel is located across from the Greenbrier Valley Airport, behind Union Concrete along the Industrial Park Road. The farm is in a prime development area in the booming Lewisburg, WV area. Access to all the major cave systems in Greenbrier County are potentially threatened by the rapid population growth and development of the area, and by increasing liability concerns. WVCC has regained access to Maxwelton Sink Cave and this cave offers outstanding scientific, educational, and recreational opportunities. WVCC will maintain and protect that access as to maximize these opportunities. Presently, all other entrances to the cave have been closed either naturally or by development. 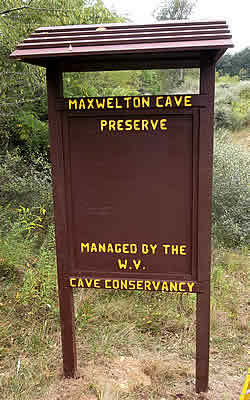 Maxwelton Sink Cave is listed on the West Virginia Significant Cave List for length, depth, hydrology, geology, and esthetics. The cave has three entrances, the main Cove Creek Entrance that was first used to gain access to the cave, the Airport Entrance, and the recently dug open Scott Entrance. Maxwelton Sink Cave is one of the longest of a series of so called “contact cave systems” located in the historic “Great Savannah” of Greenbrier County. These contact cave systems are known for extensive passage development in the contact zone between the overlying Mississippian Greenbrier Limestone and the underlying MacCrady Shale. To date, over 10 miles of passage has been surveyed in Maxwelton Sink Cave. Maxwelton Sink Cave lies between two other major contact cave systems: Benedicts Cave to the southwest, and McClungs Cave to the northwest. All these systems are interrelated, and connection potential exists for all of these systems. A total of 5 major contact cave systems are developed adjacent to each other in this area. A total of 77 miles have been mapped so far in all these systems. Major stream passages in Maxwelton Sink Cave were formed near the limestone/shale contact, and are cutting down into the underlying red shales of the McCrady Formation, yielding interesting passage morphology. In addition, numerous faults and folds have been documented, and the cave shows interesting passage modifications where these features are encountered. Hydrologically, Maxwelton Sink Cave has several infeeder streams that travel from the surface down-dip to the master trunk stream. This stream has been dye traced to an eventual resurgence at Davis Spring, approximately 15 miles to the south on the Greenbrier River. Maxwelton Sink Cave serves as a major in feeder to the 65 square mile Davis Spring drainage basin. Certain areas of the cave do contain abundant formations. The surface resources will be maintained in as near natural state as possible, based upon the needs of the conservancy. Maxwelton Sink Cave was originally dug open in the late 1960s by various groups of cavers. A culvert was placed at this entrance, the Cove Creek Entrance, which was at the base of a large cliff near the airport. This entrance proved to be the main entrance, even after a second entrance was located very close to the airport. In 1973, the remnants of a large hurricane swept through West Virginia, filling in the Cove Creek Entrance with large amounts of debris. This entrance has not been re-opened due to the extensive dig required to regain access. Meanwhile, in the mid-1970s, the Airport Entrance was closed when development of a warehouse near the airport covered this entrance. The WVCC and local cavers have been in contact with the current owners who have agreed to similar management policies if that entrance is ever successfully opened. This new dig site was owned by Dave Scott and his associates. Dave, a long-time caver, had performed a surface survey from the Cove Creek Entrance to his property to determine whether cave passage previously mapped existed under his land. Once discovering that it did, microgravity surveys were conducted to determine the exact location of the passage. After these tests proved that the cave did exist there, a dig site was chosen and access to the cave was again gained via this new entrance. DNB, LLC offered 5+ acres of land surrounding the newly dug open Scott Entrance to the cave in late summer of 2008. The land changed hands on October 17, 2008, and is now owned with an underground easement by the WVCC. The cave will be maintained in an “open” condition, with emphasis on survey and research. Access is freely available to all vertically-competent, responsible cavers over the age of 18, regardless of any organizational affiliation. Novices will be discouraged. If, in the future, additional information indicates that some resource needs some additional level of protection, whatever minimal controls needed to protect the resource may be instituted. In general, access to the cave will be maintained as open as practical. No cave-for-pay or any other activity “for pay” is allowed. Advance notification of visitation to the cave will be required, since the entrance will be locked and sealed due to its location and need for airflow control. There will be a list of keyholder/combokeepers posted. WVCC will publicize Maxwelton Sink Cave only to the extent necessary to accomplish our mission goals. Publicity of details and location information will only be available within the established caving community. Publicity available to the general public will be limited to information needed to promote our educational and scientific goals. In the event of a rescue at the cave, WVCC will make every effort to minimize media coverage, especially any location information. The Board of Directors has established a management committee to implement and monitor this management plan. The Board will be responsible for any plan changes. The management committee will report to the Board on the status of the preserve, with any recommendations for changes to this plan. 1. No camping or fires will be permitted at this time. 2. All trash and human waste must be packed out. 3. ATV’s, dirt bikes, and snowmobiles are not permitted on the preserve. 4. Collection of rocks, flora, fauna, etc. on the surface is prohibited. Any collection underground must be done in accordance with West Virginia laws, which require a permit from the state, based in part on permission from the Board. The Board will approve such requests on an individual basis, based on scientific need. 5. No placement of permanent bolts, standing ropes or anchors is allowed. No other defacement of the cave is allowed. 6. Parking is allowed only in designated areas. 7. No hunting will be allowed on the property. No fireworks or firearms will be allowed on the property. 8. No commercial activity, including cave-for-pay, will be allowed on the property. 9. Visitors’ conduct should conform to National Speleological Society conservation guidelines, and to NSS Safety and Techniques Committee recommendations. 10. Visitors are expected to comply with all applicable state and federal laws. 11. A metal ladder will be installed in the 45-foot vertical entrance culvert and a belay will be required if the caver chooses to use the ladder for entry into the cave. 12. The entrance culvert (a 45-foot vertical drop) will have a sealed lid with a lock on it. The Maxwelton Sink Cave Preserve Committee will be able to release the combination or key when appropriate. 13. Existing trails through the delicate areas of the cave will be labeled and all visitors will be required to follow these routes. 14. The surface property will be allowed to revert to a natural state. An informational kiosk will be placed on the preserve. All necessary information, including the rules of the preserve, and information about the conservancy and the NSS will be posted on the kiosk. There is potential that a changing area will be constructed near or on the entrance. A vehicular right-of-way and parking area will be developed.